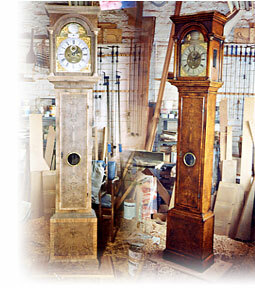 We carry out clock case restoration and also have the contacts for the overhauling and servicing of the movements as well as the restoration of painted and brass dials. So we can offer the complete “package” of collecting, servicing the movement, casework and finally delivering back and setting up the clock. We also recommend screwing the case to the wall for stability, which we would be more than happy to do.